Hallelujah, it’s BBQ time in Edmonton! Well, to be frank, it’s almost always BBQ time in Edmonton. We don’t let a bit of snow keep us from our burgers, we just simply take the shovel and clear the deck off so we can BBQ something. Hallelujah! It’s the time of year when we don’t have to wear snowpants to BBQ! Thank you spring, for finally arriving. I am seriously cranky with the weather here the past few years and maybe it’s because we don’t have to be here. We could move, anywhere we wanted, really, excepting Barbados seeing how I don’t have a cool million to drop on a house there. But then there’s the whole friends, family and community thing we have going on here. BBQ-ing makes everything better. BBQ-ing without a jacket on makes me happy. Seeing my deck furniture cleaned and out makes me happy. Sure, we all know we are going to get a nice big dump of snow anytime now, it IS May in Edmonton. That’s ok. I’m enjoying my deck chairs and will simply clear that snow right off. I had steaks the other night that I wanted something really neat and simple to go with them. I also had a ton of avocados that were ripe enough to use. Why must they all ripen at the same time? Why? Who needs 10 ripe avocados? I have 10 because my son loves to eat half an avocado in a sitting using a spoon to scoop it out. However he forgets we have them and then I have a bazillion avocados to use up rightnow. Horseradish guacamole did the trick! 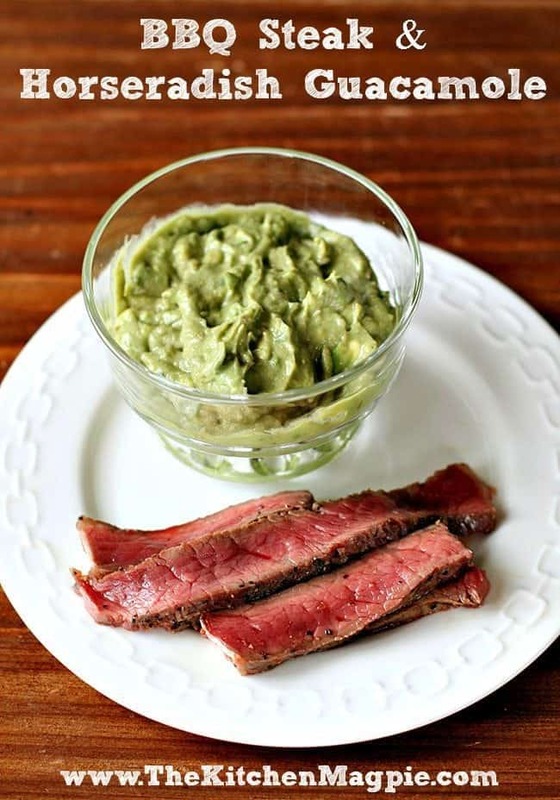 If you like guacamole and if you like horseradish, you are going to love this. Simply BBQ up your steak then slice it into thing strips. 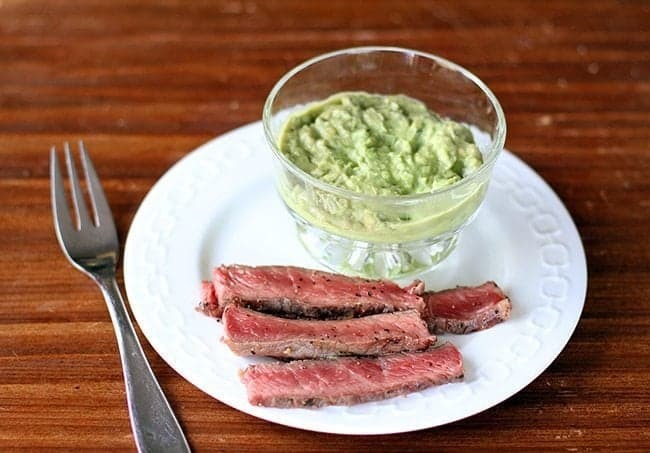 Serve it with a dish of the horseradish guacamole and dip away! Now, as you can tell, I like my steak rare. Oh-so-bloody-rare. Yum. It has to be a low iron thing, I swear. I could almost eat it blue, but I like the meat heated. This is also fabulous on chips for a dip if you are a horseradish lover, beef roasts, and BURGERS. Yum!! Oh, I just have to try this on a burger next! So question of the day, how do you like your steak done? Rare like you’re a carnivore like moi or cooked so that it’s not moo-ing anymore? 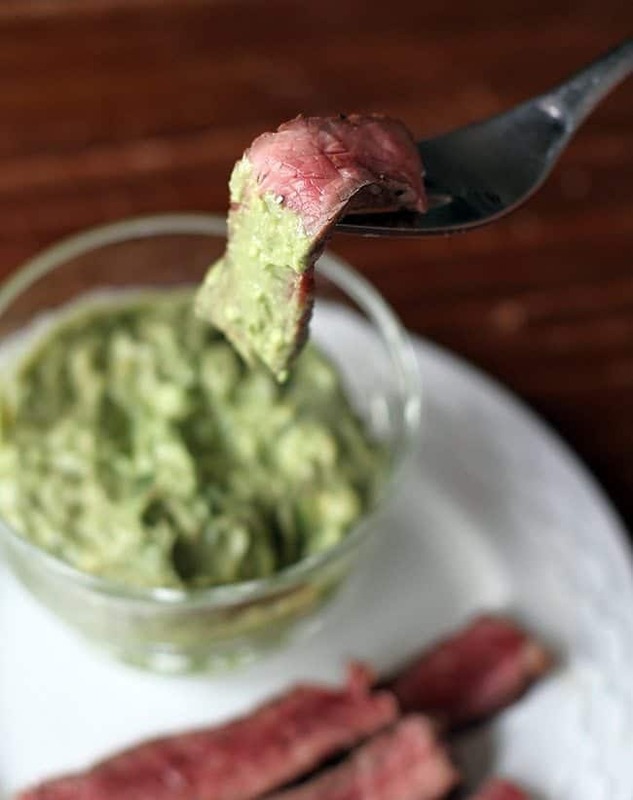 Tangy horseradish guacamole is the perfect dip for steak and beef roasts or try it on your next burger! Mash the avocados in a small bowl. Cover and chill at least an hour to let the flavors blend. Prepare your steak on the BBQ then slice into small pieces and dip! It sounds like a great combination! And another great condiment! Wow that looks so tasty, thanks for sharing this recipe.